One of the most sought-after polish any girl (or awesomely flamboyant guy) can own is a really good holo nail polish. The China Glaze OMG collection immediately comes to mind...then disappears...because at this point no one is willing to spend $225 for this collection. Seriously. There's an eBay auction that starts the bidding for a 12-piece set of the OMG collection at $190, with a Buy It Now price of $225. Ouch. That collection will remain a pipe dream. BUT! In the meantime, I find myself totally satisfied with my $3.97 polish from Savina (at Nordstrom Rack) called Fairy Dust. It's so pretty, and so sparkly. And so perfect over everything. This is it over black (Black on Black from Sinful Colors). See? Brilliant! It really is just like a fairy came to my apartment while I was doing my nails, sneezed and covered my very boring black manicure. Thanks Fairy! 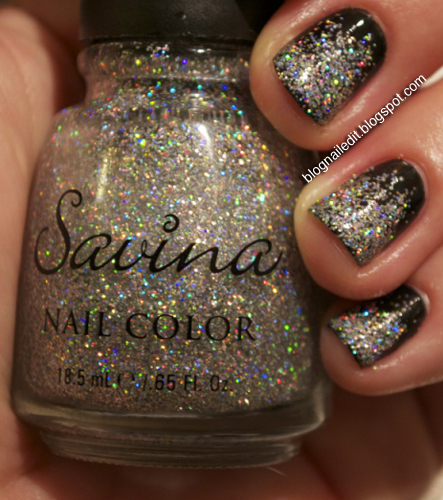 So if you're ever looking for a holo you can afford and adore, I recommend this as a good start! Like I said, I found mine at Nordstrom Rack. They also sell a ton of OPI there if you're looking for those polishes. How many coats was this? I have INM Northern Lights and it has less glitter, but still very holo. Mihaela: The Black on Black was two coats, and the Fairy Dust was three in the most filled in parts of my nails. I only used one as I got closer to the bed of the nails so I could achieve that gradient effect. I HIGHLY recommend getting Fairy Dust. I'll probably do a post with just that color on my nails, over a silver solid. SO stinkin' pretty! Very pretty but unfortunately can't get this brand over here. So I guess I will stick with my Northern Lights. We have it in the US and I'm definitely going to order it. I also have China Glaze fairy dust, but I "need "both. Lol!